St. John Bosco continues its strong presence in college athletics with 16 football players continuing their educational and athletic careers at higher levels. Winter Signing Day was very exciting day for Bosco Football, its players, families, and the Bosco community as a whole. Here are the athletes that signed back on February 6th, as well as the early enrollees already at their chosen schools. Within this first-class group of athletes, every journey has its own story. Every student-athletes tale is unique culminating in this day. Childhood dreams, maybe early sparks of talent or even lately realized and honed skills. Tragedy, loss, setbacks, rare opportunities and hope all act as factors. Sua’ava Poti – at a powerful 6-foot-3, 275-pound frame – will represent Bosco next year at the University of Oregon. Poti expressed love and respect for his Bosco coaches and a deep appreciation for his family. Three young athletes whose fathers’ passed prior to seeing their son’s dreams realized-Junior Gafa, Na’im Rodman, and Marist Talavou – acknowledged the acute loss of those men and the deep and abiding love, support, and sacrifice their loving mother’s had made to get them to this point. “You’ve done your part mom, and now it is time to do mine. This feels incredible and when I signed my letter of intent it was everything to me because my father’s dream was to see his kids work hard and go to college. The best part is knowing my dad was a diehard Ute fan. If he was here right now, he would’ve been decked out in Utah gear,” said Marist Talavou. “My dad was a really big figure in my life and losing him at age twelve was probably the hardest thing any kid have gone through. But, dedicating my life to him was the best thing I have ever done. I used him as my inspiration to get done what needed to be done ensuring that, when all is said and done, I would be able to say that my dad’s ticket to heaven was also my ticket to a prosperous life. I will be forever grateful for his guidance throughout this journey,” said Junior Gafa. “The loss of my dad affected me a lot because he was someone I looked up to and he was the one who got me into sports. It felt great honoring him because it was something we always talked about when I brought up my dreams as a kid,” said Na’im Rodman. Colby Bowman – a wide receiver attending Stanford University next year – offered these thoughts about signing with his teammates. “I have dreamed of signing day since my freshman year. It went amazingly and I am so glad I finished my high school career at St. John Bosco. It could not have been with a better group of guys, either. I am so proud of all of them and cannot wait to see what the future holds for these guys,” said Bowman. In true Bosco fashion, and yet one more thing that sets our school apart from the rest, the athletes and staff dressed school formal for the event. The coaches took time to speak personally about each athlete and then yielded the floor to the athletes themselves. Dry eyes were a rarity in the room as, once again, St. John Bosco athletes demonstrated class, candid emotion, and even humor. For those athletes who had early enrolled, a December 19th ceremony was held so that those young men had the opportunity to speak and sign as well. The future is bright for all of these student-athletes as they continue their academic and athletics careers. The St. John Bosco Braves took care of business once again in Simi Valley last night, defeating Oaks Christian 56-10 to advance to the CIF Southern Section Finals. The start of this game didn’t go extremely smoothly for the top-ranked Braves, as Oaks Christian came out strong and tied the game at seven early on. Braves quarterback DJ Uiagalelei threw just his fourth interception on the season and Oaks running back Zach Charbonnet ran for a 61-yard touchdown. However, the Braves took control and dominated the game from that point on. Uiagalelei threw four consecutive touchdown passes before halftime hit, two each to junior Kris Hutson and senior Jake Bailey. The Braves took a comfortable 35-10 lead into halftime, and kept their foot on the pedal in the second half. George Holani ran for two scores in the second half and sophomore standout wide receiver Beaux Collins reeled in a 71-yard touchdown from Uiagalelei. Uiagalelei finished the game with six touchdown passes, going 13/15 on his attempts with 361 yards. The Braves will now prepare for their third consecutive CIF Southern Section Finals matchup against rival Trinity League opponent Mater Dei. Bosco handled Mater Dei easily back in October, defeating the Monarchs 41-18 on the road in a statement victory. However, Mater Dei will for sure be better and more motivated to play this time around, so Bosco will need to be ready to play. The Braves are two wins away from a state and likely national championship, and we’ll have the breakdown here on The Brave News later this week. Following a 49-0 beatdown of Serra in round one of the 2018 CIF Division 1 Southern Section playoffs, the St. John Bosco Braves will travel to take on San Clemente High School this Friday. 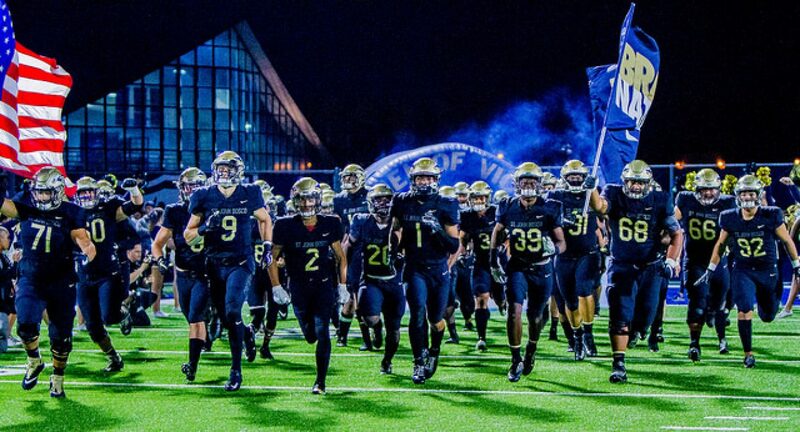 The St. John Bosco Braves are the clear number one team for high school football in America. This season, they’ve faced very little competition in many matchups, but the road gets harder from this point on. Quarterback DJ Uiagalelei has been unbelievable all season for the Braves, currently posting a ridiculous 38 touchdowns to just two interceptions on the year over 2610 yards. St. John Bosco running back George Holani has been a workhorse all year as well, posting a 9.3 average in yards per carry and scoring a total of 21 times. Receivers Kris Hutson, Jake Bailey, Colby Bowman, and Jude Wolfe have been huge all year as well, collectively combining for 31 of Uiagalelei’s 38 total passing touchdowns. Bosco’s defense, led by recent All-American Bowl commits and cornerbacks Trent McDuffie and Chris Steele have shut down teams all year, and will look to continue that throughout the postseason. The San Clemente Tritons are easily one of the hottest football teams in Southern California, especially after a very lackluster 1-4 start. Since that tough start, the Tritons have won six straight games, including last week’s 49-26 victory over Murrieta Valley in round one of the playoffs. Back on September 7th of this year, San Clemente lost to Murrieta Valley 55-38, showing their much-apparent improvement over the last few months. The Tritons statement win came against league rival Mission Viejo, when they defeated the Diablos 21-20 in an extreme grind-it-out game to wrap up their perfect 4-0 league record. On paper, the Braves are clearly the more skilled team and are more physically-gifted then the Tritons. Even with Bosco’s long road trip and the pressure of a playoff game, it’s going to be extremely hard for San Clemente to win this game. The combination of the Braves high-powered and explosive offense and lockdown defense should make this a game decided early on. However, at this point in the year, no team can be overlooked. One bad game sends you home. If the Braves do return to Bellflower victorious after Friday night, they’ll take on the winner of league rival JSerra and highly-ranked Oaks Christian in the semifinals at Cerritos College. However, one game at a time. The Braves will look to get the job done this Friday and continue their state and national championship push. This Wednesday at St. John Bosco High School, seniors Chris Steele and Trent McDuffie were both honored with 2019 High School Football All-American Game invitations. Steele and McDuffie with defensive backs coach Colin Lockett. Steele and McDuffie have been anchors all year for a top-ranked Bosco defense, both playing cornerback for the Braves the majority of the year. The two have made a dominant duo at the position, affecting the passing game of opposing teams week-in and week-out. Steele has played at and attended Bosco all four years of high school, developing into a five-star cornerback and earning multiple scholarship offers for his tremendous performance on the field and in the classroom. McDuffie recently transferred to St. John Bosco from Servite High School last year, and is also a five-star prospect, listing as an athlete because of his positional versatility as a cornerback, running back, wide receiver, kick returner and punt returner. The All-American Bowl sent two representatives to honor McDuffie and Steele with official jerseys for which they will wear at the game. Both McDuffie and Steele expressed their gratitude and reflected on their successes in their speeches they gave after. Recent All-American Game participants have included NFL players Christian McCaffrey, Odell Beckham Jr, and Haloti Ngata, so this invitation for Steele and McDuffie says a lot about their ability and future in football. The All-American game will take place on January 5th, 2019, and will most likely be shown on ESPN or some other major television network. Make sure to tune in to support the two as they showcase their talents. Both players will be playing Division 1 college football next year barring something unforeseen. For now however, the two will look to continue to anchor Bosco’s defense and lead the Braves to a state championship and possibly their first national championship in five years. The nation’s top-ranked high school football team, St. John Bosco, takes on Serra High School in the first round of what the Braves hope to be a deep run to the CIF State Title and National Title. The Braves currently sit comfortably at the number one spot of almost every single poll in America behind a 10-0 record. No doubt the Braves have high expectations from their fans and from themselves as well. The team dominated almost every game in the regular season with ease. Even with top ranked teams Mater Dei and Orange Lutheran in the way, Bosco easily navigated and beat both talented teams by more than 20 points. The formula to Bosco’s constant dominance is simple: have a great offense that scores quickly and get after the quarterback and play extremely aggressive defensively in the first half, then coast in to victory in the second. This formula has resulted in constant blowouts all season long for the Braves. With allowing no more than 28 points in a single game all year long, Bosco’s defensive intensity has been key to their success. Their offense, led by junior star quarterback DJ Uiagalelei, has put up huge numbers, scoring more than 45 points in eight of their ten games. With an 0-4 record on the road this year for Serra, Bosco should take care of the cavaliers this Friday at home with no problem. Serra lacks the size and talent that the Bosco obtains, and on paper Bosco is just clearly the better team. The game looks like it can turn into a lopsided one real fast, as Serra is clearly outmatched. However, with this game being the first round of CIF, the Bosco’s focus has to be their focal point. They can not look ahead to the semi-finals or state championship game yet. They have to be in the now and take every week one week at a time and not overlook anyone. The team and “The Tribe” will need to be energized Friday, as the Braves take their next step towards hopefully what is successful November postseason run.